Home > Traditions and History > Where did Santa Claus come from? Santa Claus is the English version of Sinterklaas. Sinterklaas (or, more correctly, Sint-Niklaas) was a Turkish bishop who gave away his whole fortune to the young and needy, and every year in his memory parents in quite a few continental European countries celebrate the Sinterklaas festival on the 6th of December by giving toys, chocolate, marzipan and tangerines to their kids. The name is not the only thing Santa Claus and Sinterklaas have in common: the Sint, as he's casually called in Dutch speaking countries, goes around dressed in a fancy red costume and has a big white beard - much like his counterpart from the North Pole. InTurkey (not to be confused with the classic Christmas dish) he is called "Noel Baba"
In Bulgaria he goes by "Dyado Koleda"
In Albania kids address their wish lists to "Babadimri"
The Italians refer to our bearded friend as "Babbo Natale"
The Russians call him "Ded Moroz"
Santa doesn't always visit on the same day either: the figure of a man bearing gifts may be a worldwide phenomenon, but various religions or religious factions have all chosen to colour in the specifics of this tradition in their own ways. So is it that in Eastern Orthodox traditions, the merry man comes round on New Year's Day. One thing seems to be common in all the various depictions of Santa Claus: he is a good and jolly man with a big round tummy who's just crazy about kids and loves giving them presents to make them happy and reward them for being good all year long. Generally in the Western world, Santa makes his way round the world in a sleigh pulled by flying reindeer, headed by Rudolph with his shiny nose. It has been proved by an English professor that the original Christmas rhyme was written by Major Henry Livingston, Jr. in 1807 and called - Account of a Visit from St. Nicholas. Clement Clarke Moore was only credited with the nursery rhyme after an friend published it in a newspaper. Santa lives at the North Pole and has a legion of elves to assist him, commonly known as Santa's little helpers. Santa delivers his presents by climbing down the chimneys of the houses he visits. He is magic so no need to worry if you don't have a chimney. He likes you to leave a mince pie and a glass of wine or sherry out for him - and perhaps a carrot or two for the reindeer. Whatever you do, don't try and stay awake on Christmas Eve to see if you can spot Santa - his reindeers do get a upset by children who aren't asleep before midnight. 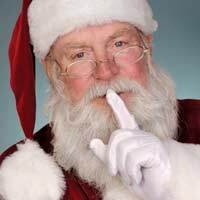 Santa is also married, and he, Mrs Claus and the elves spend 363 days out of the year making toys in their North Pole toy factory. Ho ho ho!